To gain an edge over their competitors and raise profits, many business owners illegally define their employees as exempt independent contractors, costing state and federal governments untold billions of dollars annually and putting workers at risk. 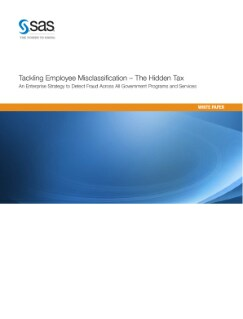 The information needed to identify employee misclassification is spread across many departments in state and federal government, as is the responsibility for enforcement, making detection and prevention difficult – if not impossible. Authorities must incorporate strategies and detection tools that take an enterprise approach to combat employee misclassification. This paper explains how, using the SAS® Fraud Framework for Government, some governments are consolidating information and utilizing sophisticated analytics to provide robust detection capabilities across all government programs and services to identify perpetrators and end this illegal activity.